High Uniformity, General Purpose Heat Treating Furnaces - L&L Special Furnace Co, Inc.
L&L Special Furnace Co., Inc. has manufactured a highly uniform box furnace that hardens tool steel used to manufacture decking fasteners and supports for a worldwide customer base. The equipment was sold through W.H. Kay, one of L&L’s leading representatives of furnace equipment, both new and used. Information on W.H. Kay can be found at www.whkay.com. The L&L model XLE 814 has working dimensions of 16” wide by 10” high by 20” deep. The furnace is capable of heat treating a wide variety of tool steels – from D-2 to high-speed M-2 tool steel, along with low temperature tempering. Elements are very evenly spaced around the chamber. There is an electrically operated vertical door with a foot switch. Included is a NEMA 1 control cabinet with a Watlow F4 program controller, high-limit backup system, thermocouples, fusing and all interconnection wiring. Power control is accomplished with quiet two-zone, long-lasting solid-state contactors. The furnace hearth is an upgraded silicon carbide hearth with ceramic support. The furnace is insulated with 4-1/2” lightweight insulating firebrick and backed up with 2” of insulating board. The bottom is reinforced with a high-density calcium silicate for extra support for the load weight. 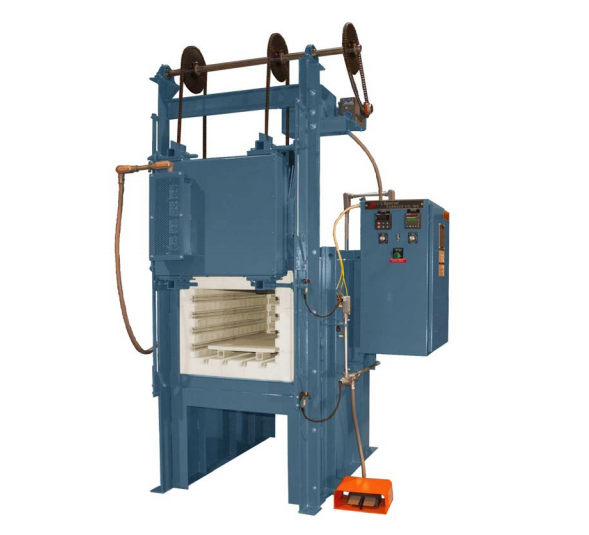 The L&L XLE series furnace comes in a variety of sizes, with custom configurations available upon request. There are also many options available for the XLE series, from atmosphere sealed casing for use with inert atmosphere to an array of control and recorder options along with recirculation fans and controlled cooling. If precise temperature control and uniformity is paramount to your process, then L&L’s XLE series is a great choice.